One reason I like making pizza so much are the great leftovers it provides. I don’t mean the cold pizza, which is in the leftover Hall of Fame, I am referring to all those great toppings that didn't get used. A few mushrooms here, a hunk of cheese there, maybe some roasted peppers hiding behind the olives. Some of my greatest omelets, pastas, and risottos have followed a pizza-making binge. This warm mozzarella and bread salad was no different. What was different was the bright idea I had when I went to serve the salad. I placed it on the table, and went to get the rest of the meal. As I looked across the kitchen, I saw the pesto glistening on the bright white cheese. It looked good. So, I decided to film the plate being placed in the sunny window as part of the recipe (which you'll see in the video). The results were stunning. The sun warmed the cheese, woke the pesto, and turned a very good bread salad into a memorable one. Now, I'm not saying the sun's rays imparted some kind of mysterious, magical energy into it, but I have been humming John Denver tunes ever since. Enjoy! Are you, like, FOX News? "CUT HIS MIC!" LOL. the sun thing is funny! now this ,is the kind of salad I'll eat. great video! J. Denver rules! If, by chance, it is not so sunny out, could a microwave on lower power be an adequate substitute? never microwave bread! wait for the sun, or put in a warm oven for a couple minutes. just serve on salad plates with a fork. You can also put it next to or on greens. I saved that old "unsynced" video...gave me a laugh. thanks! i actually thought of your site when i posted. Looks great. Hey I like the video on vimeo. The picture is much better than Youtube. I think I just died because of the ending music. As always, you're a genius Chef John. Looks really good but... how is this a salad? The same way a tomato, basil, and mozzarella is called a Caprese Salad, or potatoes dressed with a vinaigrette is called a salad. This may be a silly question, but how do you make and what are the ingredients for the pesto? Where's the video? Can you put it backup, can't find anywhere. Thanks. While I do not doubt the deliciousness of this recipe, I do have a question regarding its health and nutrition (and your recipes in general). 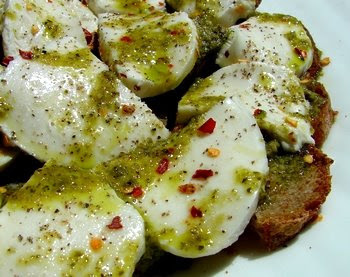 Here you use tons of oil (several tablespoons + pesto), cheese and bread. From a nutritional standpoint, this is basically just pure fat soaking a few (less-than-stellar depending on bread) carbs. Eitherway, I do love your video reviews (you have a great voice and sense of humor) and your recipes are indeed absolutely deliscious. One of the few blogs I follow these days! Where can I find this "Suhn" ingredient you speak of in San Francisco?